A first year student and the sole member of the Literature club, Yuki was conscripted by Haruhi into the SOS-dan (S.O.S. Brigade) and, to this day, is its only reason to 'justify' why they're using that room. At first, she came off as another offspring of the large Ayanami Rei gene pool - monotonic voice, aloof, near-expressionless, and one of few words. She is also seemingly a stereotypical bookworm, wearing glasses and always reading a forebodingly thick book. Such is her desire to read that she had to be dragged away from the public library when Kyon (male lead and Narrator) took her there to kill time during one of the many (mis)adventures of the SOS-dan. Later, she reveals to Kyon that she is a "humanoid interface" from the "Integrated Data Sentient Entity" (IDSE) and explains to him that her mission is to observe Suzumiya Haruhi, who they view as the answer to their problems - their evolutionary dead-end. 'Data' to them isn't what we're used to thinking of. All matter and energy is Information to this entity - something that can be manipulated as we would manipulate data with a keyboard and mouse. You could say this alien faction is more like a godlike entity that has transcended physical limitation. While not the omnipotence that Haruhi's subconscious whims have, the IDSE comes close, and Yuki is an 'interpreter' to this deity-like existence... or rather... 'priestess' would be more accurate. Kyon didn't know what to think of this quiet girl suddenly talking about things which, to any layman, would seem like something out of a sci-fi flick. The truth was revealed to him when he was almost killed by another IDSE interface who followed a different sub-faction's ideals. Yuki saved him by eliminating the rogue interface ('disconnecting her' to be precise). At Kyon's behest, she didn't reconstruct the glasses that broke in the fight - marking the start of their 'working relationship'. When the SOS-dan is faced with one of Haruhi's many outrageous demands or find themselves in a supernatural situation (always in Haruhi's absence), the first person Kyon turns to is Yuki. If Itsuki (the representative of the underground esper faction) isn't in control, Yuki delivers the required 'data manipulation' (read: 'invoke hax') to solve the case or to save everyone's lives from some unexpected danger Haruhi subconsciously created. Note the anime shows episodes in a non-chronological order. By Autumn, there had been a lot of character development for Yuki (not shown in season 1 which animated Vol 6 chapters without doing Vol 4~5), best seen in the Day of Sagitarrius III episode. Around this time, Kyon begins to read Yuki's emotions. Yuki is more competitive than Haruhi, has her own desires and can pick up new hobbies. The key to reading Yuki is to be sensitive to her head moving mere millimeters and to sense the distinct 'flavour' of her stares. By this point she has more than distinguished herself from the generic Ayanami Rei archetype. Yuki was created for the purpose of keeping Haruhi in check. It seems as if keeping Haruhi in check also meant that she would have to face her in a Saimoe tournament... thrice. In 2006, Yuki did reasonably well in both Saimoe Japan and Korea Best Moe. In Korea, she was consistent and steady, leading herself into the top 8 which included a dominant win over Kyon's little unamed sister. However, in a quarter-final match against Haruhi, Yuki can only merely keep up, as she lost by only 12 votes, therefore settling for a sixth place finish. Saimoe Japan was much more of a storyline for Yuki. After an easy first two rounds, Yuki was paired up against Haruhi in a rematch within the round of 32. This time, Yuki steamrolled Haruhi, winning with a margin of over 150 votes. Yuki followed this up with a win over fellow S.O.S. Brigade member Mikuru Asahina to make the top 8, becoming one of the favorites to win the tournament. However, in a 3200 vote high scoring matchup, Yuki lost to eventual Saimoe Japan winner Suiseiseki (Rozen Maiden) by almost 200 votes, therefore finishing 5th overall. Because Suzumiya Haruhi no Yuuutsu was not shown in 2007, Yuki took a one-year break before returning for Korea Super Best Moe 2006-2007. Unlike her friend Haruhi, Yuki pounded through the one-round preliminary to reach the knockout rounds. However, her round of 16 matchup paired her against Saimoe Japan 2006 finalist Fate Testarossa (Nanoha). Yuki never relinquished the lead, albeit extremely close to doing so and won by merely 33 votes. 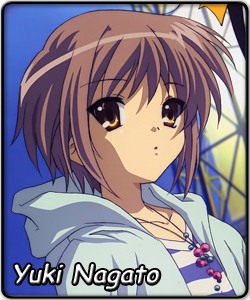 Even so, after an easy elite eight win against Nagi Sanzenin (Hayate no Gotoku), Yuki was paired against Haruhi once again, and this time, in an even closer matchup, Haruhi nearly edged Yuki by only 15 votes. Yuki finished 3rd overall. Yuki is expected to return this year with the airing of a second season of Suzumiya Haruhi no Yuuutsu. However, she is guaranteed here to have a round 4 with Haruhi Suzumiya, not to mention competition that could possibly be stronger than both of them combined. Still looking for her first Saimoe tiara, Yuki will use her intelligence to her full potential in order to win the International Saimoe League.